Experience – Observation – Action! 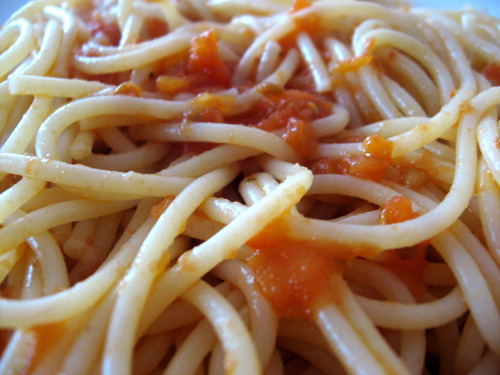 Or: How do you get from a bowl-of-spaghetti-network-diagram to knowing what to do? In a recent leadership training at the World Bank Institute we used Net-Map as a method to understand complex challenges people face in their work, from constitution reform in Fiji to corruption in business licensing in the Philippines. As experienced Net-Mapper I can often listen to the discussion, look at maps and distill the mayor insights and possible actions intuitively. But intuition is just a short-cut your brain can take because you have done a thing a hundred times. How do I teach novices a step-by-step approach of getting to these insights? I am taking my cues from adult education here and have developed a sequence of experience (draw the Net-Map), observation and action (or, to be more correct but use less straightforward language: actionable insights). I have found that a lot of people like to talk about actions as soon as they have finished the Net-Map, or even before drawing it: There is a problem, what shall we do to fix it? Unfortunately, that often leads to quick fixes that do not get to the root of the problem. Because of this tendency of some participants, I facilitate these steps very explicitly. After they have drawn the map I tell them: “There will be two more steps. You may want to do the second step immediately but it is crucial that you do the first step first. I am telling you about both now so that you know the second step will come.” In the “observation” I ask participants to look at their maps, think about the discussion they had and figure out what the main issues are, main problems, bottlenecks, opportunities, storylines. Write on a flip-chart to share with their colleagues later. Then, and only then, they can continue to answer the question: What shall we, what can we do about this? Who else can do what about it? What are next steps? After they have gone through these two steps and prepared two flip charts they can share their observations and actionable insights with the larger group. This approach is also helpful because then the others can identify whether possible open questions, misunderstandings, biases are on the level of observation or on the level of actionable insights – did they make a mistake in identifying the problems or did they identify it correctly but chose a solution that may not work?